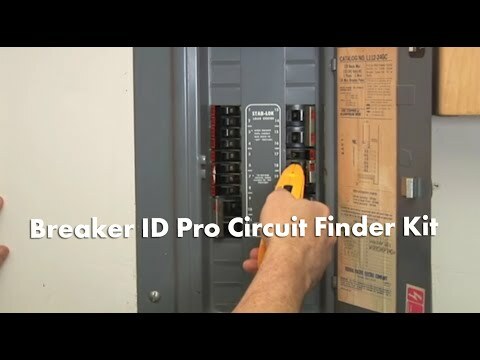 The Breaker ID Pro Circuit Breaker Finder Kit finds circuit breakers in residential, commercial, and industrial environments. It calibrates automatically so all you need to do is connect the Transmitter to the circuit and scan the breaker box with the included Receiver. On the first scan, the Receiver calibrates to the circuit breakers. On the second scan, it takes what it learned and indicates the target. (During the first scan, the Breaker ID Pro may indicate more than one breaker as it memorizes each circuit.) A green LED and audio signal will identify the correct breaker so you won’t need to haphazardly guess and cut power to essential gear like computers, servers, and appliances that shouldn’t be turned off. The Breaker ID Pro Kit comes packaged in a case and includes clips and blades for easy access to most outlets, including 230 and 240 V industrial. The kit also contains a light socket and 120 V AC plug adapters for use with finished circuits. neutral line and the other lead to one of the three power lines. Do not exceed 277 V AC.